Some scars grow lumpy and larger than the wound they’re healing – this is called keloid scarring. 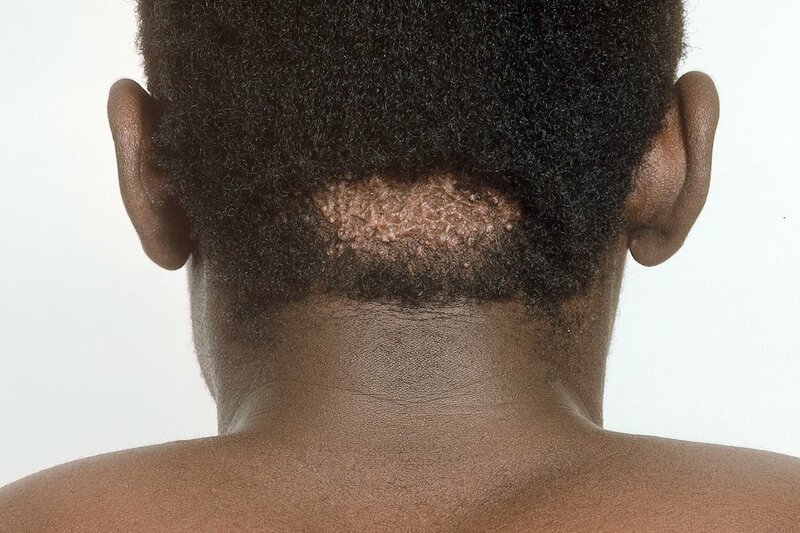 Anyone can get a keloid scar, but they’re more common in people with dark skin, such as people from Africa and African-Caribbean and south Indian communities. Collagen gathers around damaged skin and builds up to help the wound seal over. The resulting scar usually fades over time, becoming smoother and less noticeable. But some scars don’t stop growing, invading healthy skin and becoming bigger than the original wound. These are known as keloid scars, which affect around 10-15% of all wounds. Experts don’t fully understand why keloid scarring happens. They’re not contagious or cancerous. Keloid scars can sometimes develop after minor skin damage, such as burns, acne scars and even chicken pox, but they can sometimes happen spontaneously with no history of skin trauma. If you have had a keloid scar before, you’re more likely to get another. Keloid scars can affect anyone, but they’re more common in people with dark skin and it’s thought they may run in families. Younger people between the ages of 10 and 30 are more likely to develop them. Treating acne will reduce the likelihood of acne scars appearing. Avoid minor skin surgery to areas more prone to keloid scarring (the upper chest, back and upper arms) if possible. If you’re bothered by a keloid scar and want help, see your GP.